Which are the best paint colours for your new renovation? Choosing the perfect colour can be tricky. 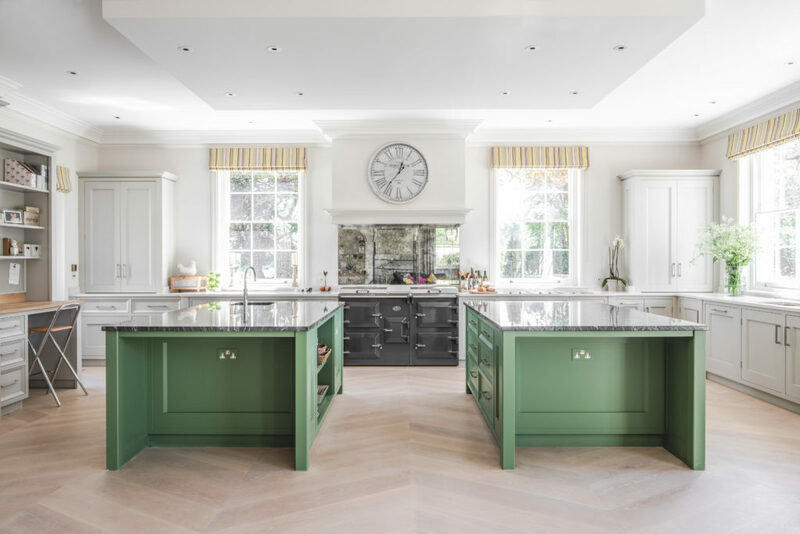 Guild Anderson Furniture are so often asked for their advice on what makes for a good paint colour scheme, they have recently launched a paint advisory service. Hannah Anderson heads up the new Colour Consultancy service. 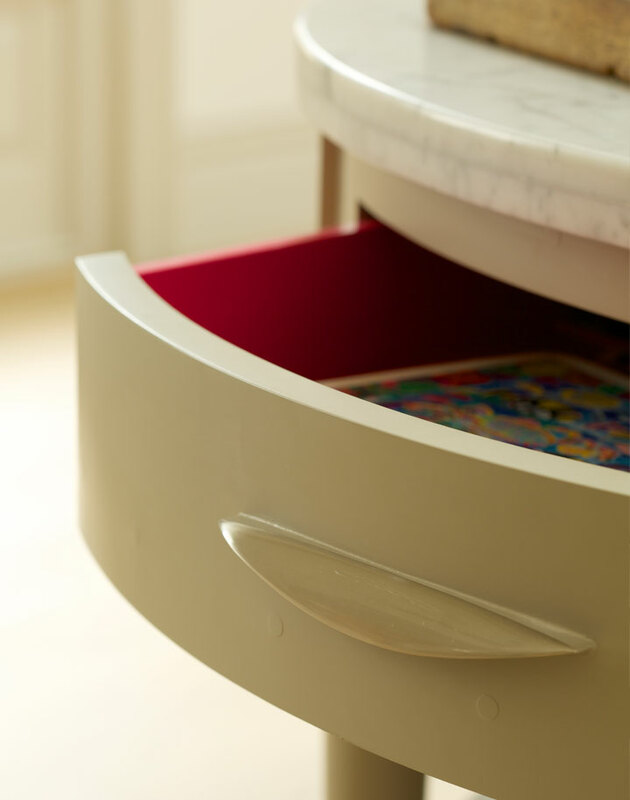 The Colour Consultancy is free but reserved for clients only, as part of a cabinetry design project. Below, are a selection of successful paint combinations from some of our recent projects. Favourite selections are from the premium paint brands Farrow & Ball, Little Greene and Picture & Paper Library. Clients have clearly moved away from the classic country house days of cream on cream, the colours today being seen as too dull and flat. 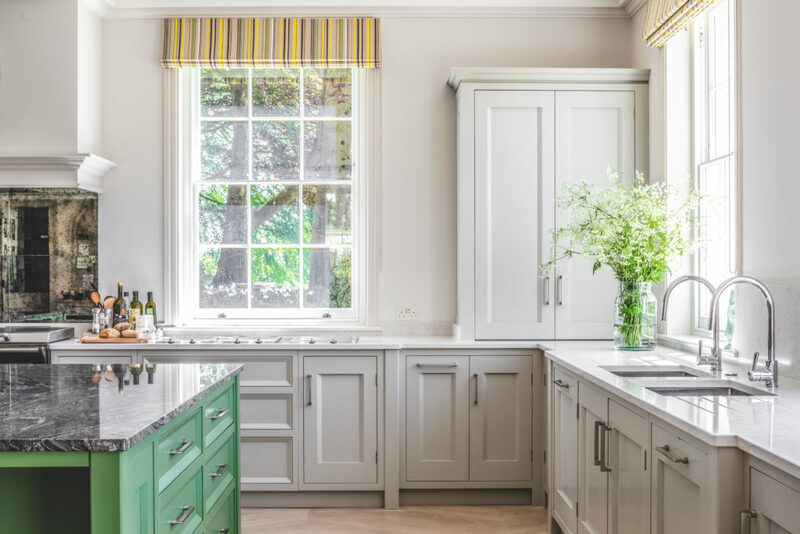 The world of paint colour is constantly evolving with different finishes, colours and technical changes to keep the market thankfully fresh and exciting. Which are the best paint colour combinations? Larger rooms can cope with a braver, bolder colour choice. In this example (pictured), the island is painted in the fabulous Apple Smiles II, a strong green from Paint & Paper Library which allows the island to feature and compliments the hand-painted cabinetry in a pale P&PL Slate V.
As a smaller room, this kitchen (below) has been one of our most successful projects on Pinterest. It is in some ways the ideal kitchen: a great size to cook in with everything near to hand, and an eating area in a new garden room extension. 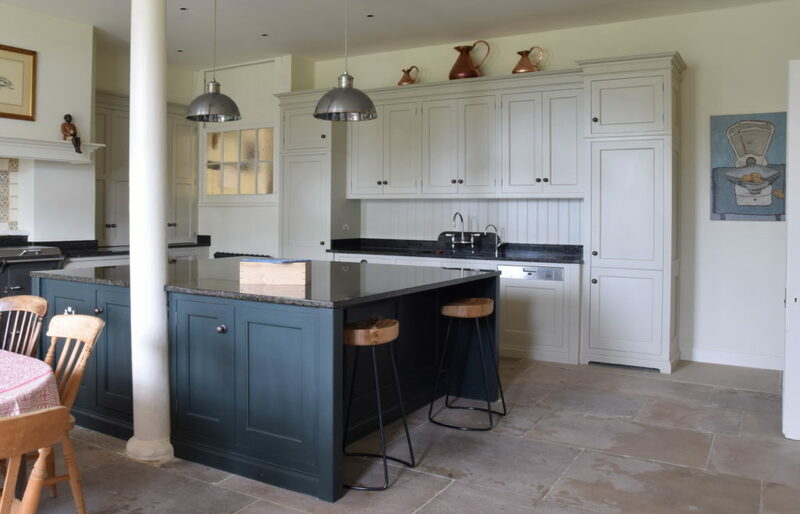 The colours are calm, comfortable and fairly restrained, with cabinetry in Purbeck Stone and an island in F&B Mole’s Breath. Although Guild Anderson are seeing clients moving away from the pure, hard greys, the fact is that the palette of greys is so easy to live with. Changing so much in different lights and from one room to another, the greys remain an enormously popular choice due to their flexibility. Recent demand has been stronger for softer grey colours such as Drop Cloth, Shaded White or Cromerty, all from F&B. Hannah describes these as ‘tonal greys’: these are not straight greys but can be used in the same way. Although a supporter of neutral shades, Hannah tries to dissuade clients from choosing colours with too definite or oppressive a grey such as F&B’s Cornforth, a braver choice. Colours like F&B’s Lime White, Vert de Terre or Ball Green, Hannah feels to be warmer and softer and far more positive shades of grey. F&B’s Hardwick White is another interesting grey with great depth due to the fine pigments used by Farrow & Ball: some see it as a grey, Hannah says, some see it as green or grey-green. ‘It is a very open choice, a non-grey grey.’ Hannah comments. ‘Colour is so subjective and much depends on the light in a particular house, the fabrics, furnishings and context. Your best approach is always to consider a paint in context, not just on a chart’. Asked to describe her ideal scheme, Hannah would always prefer muted colours. 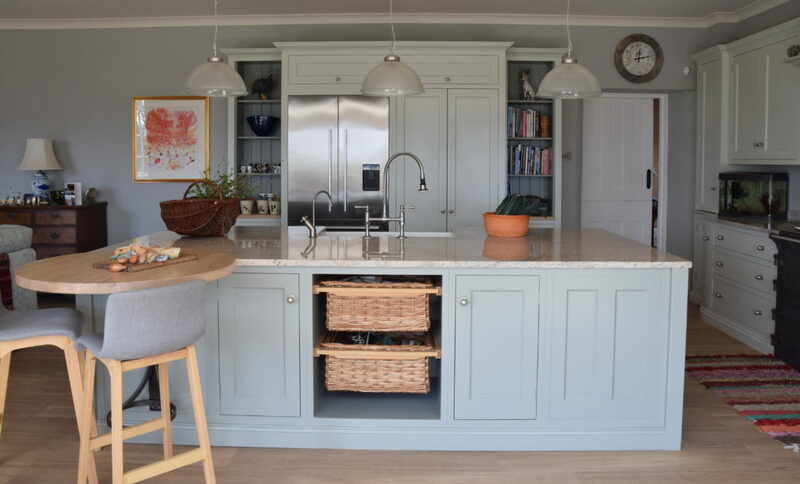 This combination (pictured) from Farrow & Ball is one of her favourite soft colour schemes and is perfect in the rural setting of this house. 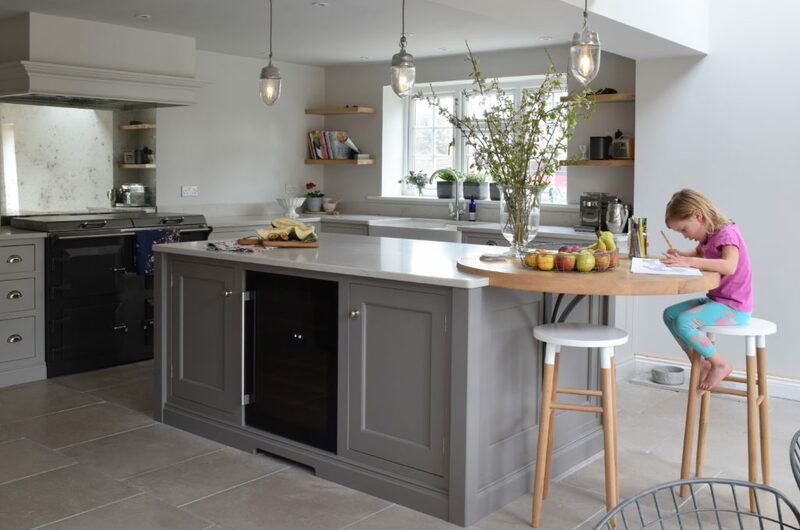 With woodwork in Slipper Satin, cabinetry in Cromarty, an island in Pigeon and walls in Lamproom Grey, this softer scheme is particularly easy to live with. 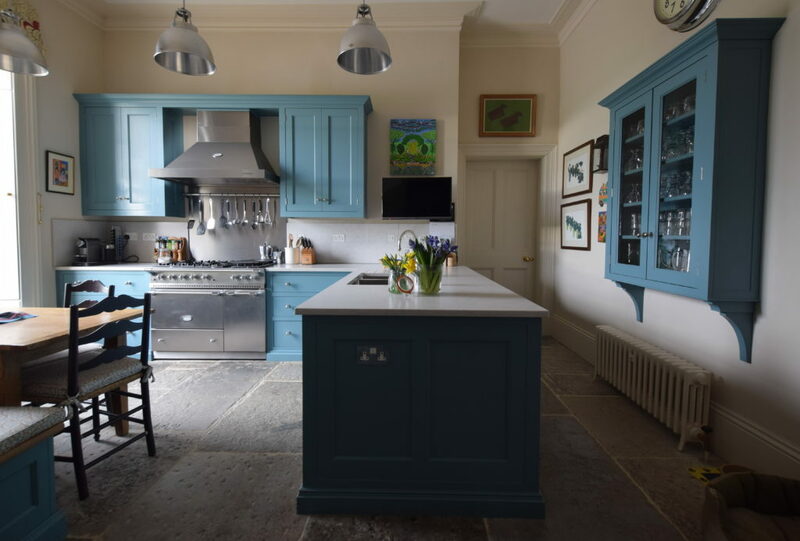 As an example of a bolder choice, Hannah might suggest a paint choice such as Little Greene’s Blue Gum. This is a colour she particularly loves for its vibrancy and originality and one which shows up equally well in bright conditions as rooms with lesser natural light. It is a favourite colour that would suit many kitchens. She explains, “Blue Gum is not so off the wall, but is a definite colour rather than a grey or a neutral. It picks up well on linens or flowers and is just a delight in all lights. 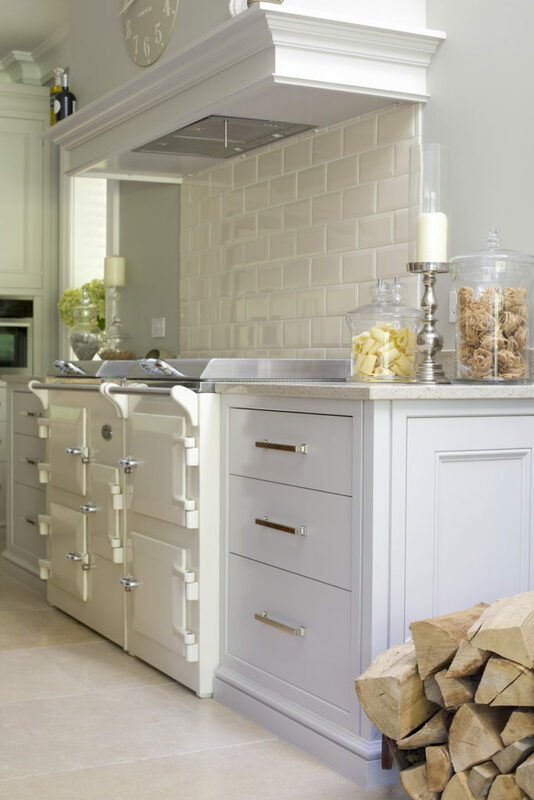 In this particular situation, the kitchen has especially high ceilings so although the run of cabinetry is fairly short, it works well without creating an overwhelming bank of colour en masse as you enter the room’. Hannah finds Little Greene’s approach of defining shades in several different depths of colour particularly helpful in choosing schemes that fit together. Cleverly, the same colour is produced in four varying depths of tone: Pale, Mid, Deep and Dark. This way, customers can be confident the colours will work together in the same room. Little Greene produce a display folder for their full range of paint colours which Hannah references for many projects. It is particularly useful for the more complex paint schemes of a large renovation. ‘The folder is expensive but is an easy way to track colours. This way, you can try the colour sheets in different rooms and not get in a muddle. Not only is it very comprehensive but it is laid out in numerical order which makes helps to locate, check colours and put them back in the right place!’ Little Greene have published a boiled-down version of colours that work together that Hannah recommends for smaller projects. The ‘Little Book of Colour’ is full of colour schemes and less overwhelming than the extended colour folder. Summarising, Hannah describes Guild Anderson’s Paint Consultancy service as being part exploration, part affirmation. ‘Some clients need more of a steer on which are the best colours for them, others simply want a verification they are on the right track. Often, we will know what we want a room to look like but just can’t work out how to get there. It is such a personal decision.’ she says, ‘I’m just here to help, just a guide. We all see colour differently so a particular colour is never ‘right’ or ‘wrong’ but it is important when you stand back that the colours are cohesive, seamless and work together for you’.